Cowering away in the shadows from a ship malfunction, a marauding Xenomorph, or some combination of the two, Katherine Waterston (Inherent Vice) has nowhere left to run in the latest image surfacing from Ridley Scott’s sci-fi sequel, Alien: Covenant. 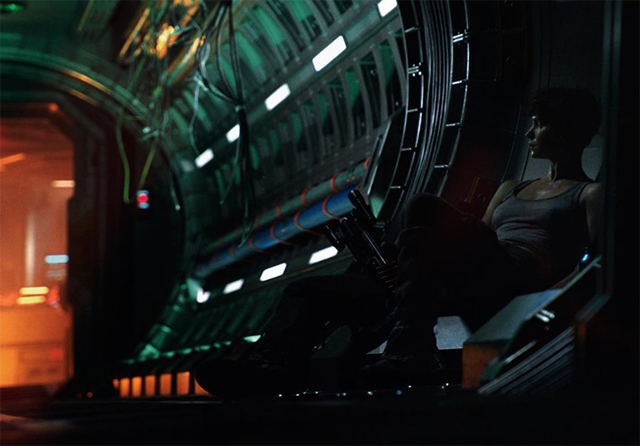 Currently simmering in the bowels of production Down Under, today’s still offers a fresh look at the film’s “fantastic” sets, and it’s likely Waterston is pictured aboard the titular Covenant space vessel, bound for a remote star system in search of an “uncharted paradise.” Minor spoilers to follow. If you’ve been keeping tabs with the movie’s production schedule – or indeed if you’re familiar with the franchise and know fine well that not all is what it seems – you’ll know that the crew will come across a fallen civilization, with set photos from earlier in the week teasing the wrath of an ancient God. Could we be about to clock eyes on the creator responsible for the Engineers? At least for the time being, all we know for sure is that Ridley Scott is aligning Alien: Covenant as the beginning of a new trilogy, one poised to dovetail neatly with the director’s own 1979 classic Alien. That opens up the possibility of fully-fledged Xenomorphs to slither onto the scene, a nightmarish terror that Waterston will face alongside her crew of fellow newcomers, Danny McBride, Billy Crudup and Demian Bichir. Michael Fassbender also makes his return as the reticent synthetic, David. Alien: Covenant will continue to lens in Australia over the coming months, ahead of a theatrical release on August 4, 2017.